Sometimes, when we’re leaving the house, we get an au revoir from the cats—Sherlock, the orange one, and his litter mate, Ms. Watson. The dog used to add to our farewell by barking, but now that he is blind, he no longer does this, and I miss it. On Wednesday, the cats had to say au revoir to Clif and me as we left to meet our friend Mary Jane for an early supper at TJ’s Place in Monmouth, a town right next to us. None of us had been there before, and we decided it was time to check it out. TJ’s Place is small—basic and clean—with a bar that dominates the entrance. Not surprisingly, along with beer, a variety of cocktails are served. In Yelp, in the comments section, TJ’s was described as having “a very hometown feel,” and that about sums it up. 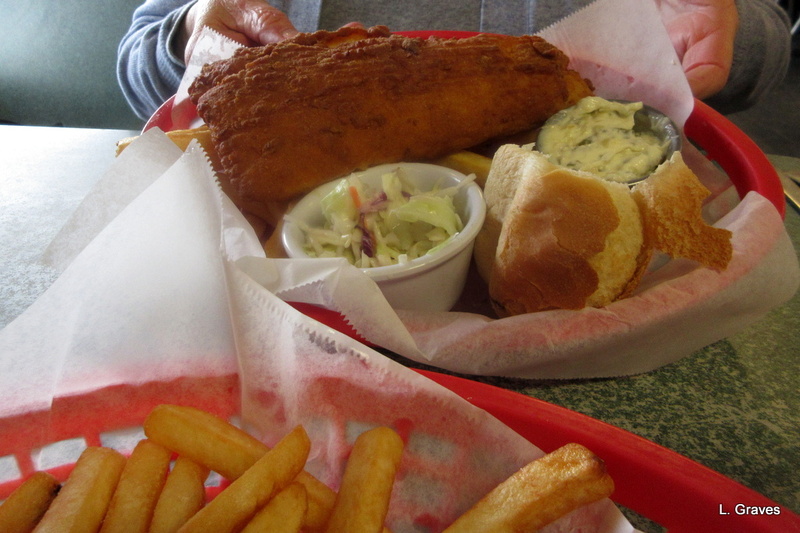 Mary Jane ordered fish and chips. She said they were delicious, with such a generous serving that she couldn’t finish her meal. 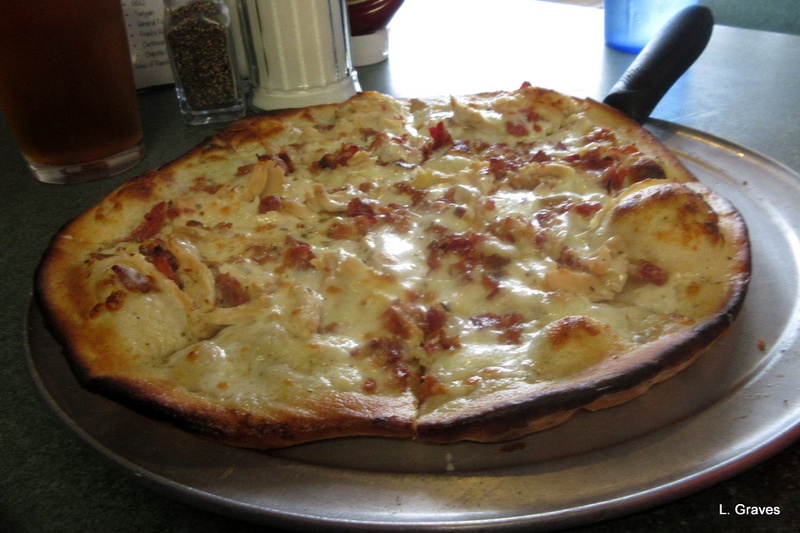 Clif ordered a pizza, a little different from the average pie, that featured ranch dressing, chicken, and bacon. Clif liked the pizza so much that he ate the whole thing and later paid the price by having to take baking soda and water before going to bed. Clif did allow me to have a bite, and I will admit that the pizza was tasty and perfectly cooked. In a word, scrummy. The server was friendly and efficient, but she never asked us if we wanted dessert or another drink. Fortunately, we didn’t want either. As we were leaving, a musician was setting up in a corner, and a notice indicated that TJ’s often has entertainment. The restaurant was filling up, and the place had a happy chatter. Both Clif and I would go back to TJ’s, either for lunch or an early supper, for the pizza but definitely not for the chicken sandwich. As we left, the sun was setting in a cloudy sky. Across the street from TJ’s is a business that stores boats for the winter. 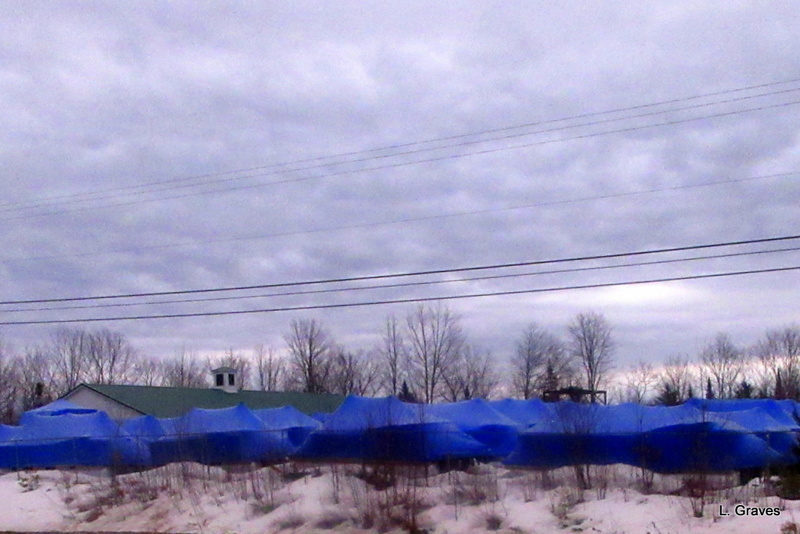 How bright they look in their blue shrink-wrap. Both Winthrop and Monmouth are towns surrounded by lakes, so much so that this area of Maine is known as the lakes region. (How I love this!) Like the rest of us, the boats are waiting for spring, for when the ice goes out, for when the weather is warmer. In the meantime, they slumber under blue. We often go to TJ’s for breakfast, sometimes for lunch. Also we go out to Hurricanes Cafe on 202 in Greene. It’s another small place, no bar, where I ‘ve never had a bad meal. At lunch you order at the counter and bus your own table. (breakfast you order at the table). 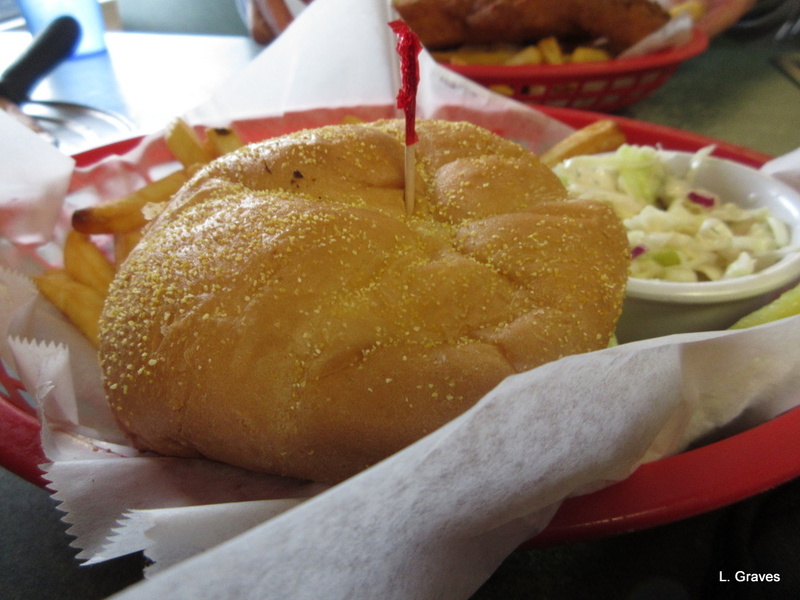 These little places are a little run down in appearance, but make up for it with good food at affordable prices. Thanks, Gayle, for the thoughtful response and the Hurricanes Cafe suggestion. I’ve never been to Hurricanes, and I’ll add it to the list. I’m completely with you about liking places that might be a little rundown but make up for it with good food at affordable prices. It’s time for me to wrassle up some dinner and all I want is that pizza. Great cats picture. I’d have been torn between the fish and chips and the pizza. Thanks, Derrick. All things being equal, I would go with the fish and chips, but that place really excels with their pizza. Loved seeing the cats’ farewell faces. I’m not a fan of iceberg lettuce either. Fun to see those cat faces bidding us farewell. There’s just something about iceberg lettuce that puts me off. A slightly sour taste that, and as I noted in my piece, this lettuce often gives me indigestion. Thanks, Xenia. Little Ms. Watson is a darling, and Sherlock is, well, Sherlock. But we love them both. Righto! When we go back, it will be for pizza. Our fur buddies are always so happen when we come back. That pizza was fantastic. Worth a return trip for another pizza. How could walk away and leave those sweet faces?! I know! And they are always so happen when we return. Who says that cats don’t care? Indeed, they do! Sherlock looks sad to see you go. Ms. Watson looks rather indifferent. Thanks, Oscar. I love fish and chips, too. I think the craft beer movement has spread across the world. Very big in Maine. As for pizza, well, what can you say? It’s good to try new places but there is always a little risk involved. I get indigestion with all types of lettuce so I have to be very careful I don’t eat too much! Our café and restaurant experiences usually end with one or other of us having to take bi-carb! I love those boats just waiting, waiting….. So you understand about lettuce! Seems so silly to get indigestion from such a bland vegetable. But there you are. And, oh, the aging stomach. Thank goodness for bi-carb. Glad you like the boats. I’m thinking of going back when there is more light so that I can get a better shot. Maybe even stop in at TJ’s for pizza. Oh, the cats. Do they really gaze at you like that as you leave them? They look absolutely posed. Wonderful picture. Thanks, Jodie! They really do gaze like that when we leave. At least sometimes. I missed this post and just saw it this morning. I love all of it so much I had to tell you even this much later. 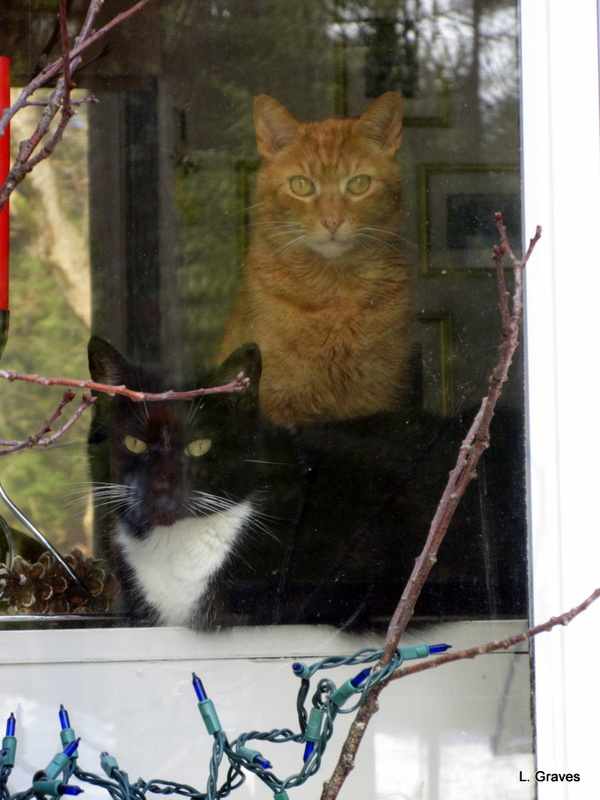 Your cats are the perfect adorable ones I’ve grown up with…marmalade and tuxedo and yes they watch you leave and return like they really are not indifferent after all. All cats need a window on the world. I love the photo slumbering under blue..such a poetic title made me very happy and I too would have chosen the chicken sandwich and been disappointed…sorry to be so wordy but I was inspired to comment! Oh and when our elderly dogs get deaf my husband always says when they become teenagers they just don’t listen anymore…trying to inject humor because don’t we want our dogs to live forever? Yes, yes! Dogs do not live long enough!